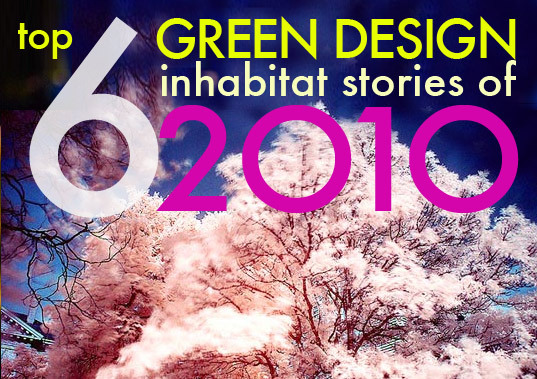 The Inhabitat (design will save the world) website has posted lists of the top green stories of 2010. Duke University study shows photovoltaic cost is 14 cents per kilowatt hour compared to 16 cents for nuclear. Concentrating troughs and reflectors are even less expensive. SolTech Energy, a Swedish company, has developed clear glass roof tiles to heat homes. Kyushu University professor Yuji Ohya and his team unveiled the Wind Lens, a honeycomb-like structure that purportedly triples the amount of wind energy that can be produced by offshore turbines. Affordable, Efficient Honeywell Turbine Hits Shelves! For home use, the entire turbine becomes the generator which always faces the oncoming wind, and it only needs winds of 2 mph to get it spinning. House-sized 4 megawatt batteries can store intermittent energy produced by wind and solar. Plus scores of other interesting articles about new green developments.